As a retailer, you have so many responsibilities to manage that I suggest using a professional to create your newspaper ad. You can find freelance copywriters, graphic design students or advertising agencies to assist you in creating an ad. Fees will vary and so will talent. 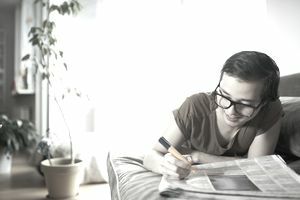 Be sure to review portfolios of past work and detail in writing what exactly you expect to be done by the individual or agency creating your newspaper ad. If you decide to do it yourself, play around with a graphics or word processing program on your computer to create what you want your ad to look like and the message you want to convey. Then take your art work to the newspaper agency (or your sales rep) and work with their graphic art designers to have them create a crisp, professional looking display ad. As with any marketing, there is no guarantee that your ad will be successful. It may take testing and revising the ad several times until your objective is met. The following are elements which you can include in your ad to increase its effectiveness. The more an ad is run, the more it seen. The more the advertisement is seen, the more it is remembered. In other words, you should run an ad as often as your marketing budget will allow. It's been my experience that you should not even consider running an ad under 6 weeks, unless it is for a huge, one-time event. Take advantage of the discount prices offered by the news agency for long-term advertising. Despite what your newspaper's sales representative may say, ad prices are negotiable. The smaller print companies, such as the local papers and trade press, are usually more open to negotiation. Waiting can also be good. We've had salespersons call us two weeks before the publication goes to print and ask if we would like to buy unused space for a discount. If you use one particular company for your marketing, you may receive extra discounts for repeat advertising. A 52-week newspaper contract can save the small retailer a lot of money. Also, if you do a lot of advertising, it won't hurt to ask for free PR. A large commitment of your ad dollars may net your business a nice write up. Before you can measure the effectiveness of a newspaper ad, be sure you know what you want to accomplish with each advertisement. Your purpose may be to increase sales or it may be to simply create brand awareness. Your goal may be difficult to calculate a response but you could run a different special or promotion in each publication you advertise with. Consider using a special code in the ad to determine which ad generates the most response. Don't forget to ask your customers how they found your business. Consider keeping a folder with all of the advertising your retail business does each year. Attach a copy of the ad slick from the newspaper, along with the invoice, to a page of notes regarding the campaign. This will document the results, the dates the ad ran, the effectiveness and the lessons learned. The next time you're ready to run a newspaper ad, take out the folder and look through prior ads to know what to do and what not to do.